Family coat-of-arms hand-painted for display at home or office. Ships FREE in US. Hand-painted and sized to bring your family surname vividly to life. Ships FREE within US. Celebrated union of two family names with coat-of-arms hand-painted. Ships FREE in US. Your family coat-of-arms is hand-painted on copper knight plaque, with FREE matching family name history. Ships FREE in US. Honor your family name with your coat-of-arms hand-painted on standard issue dog tags. Ships FREE to US. Celebrate unions with two hand-painted coat-of-arms side-by-side, with FREE matching family name histories. Ships FREE in US. 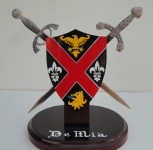 Distinguish your desk with your hand-painted coat-of-arms on a letter opener. Ships FREE in US. Your hand-painted coat-of-arms adds a personal touch to your Professional Pub or In-Home Bar! Ships FREE in US. Expertly crafted metal Knight in armor with family coat-of-arms on the Knight's shield. Stands 20" Tall. Ships FREE in US. The union of two family names each hand-painted, wood mounted and ships FREE in the US. 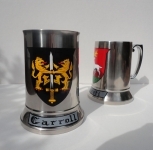 Classic 16 ounce beer tankard with hand-painted coat of arms. Ships FREE in US. 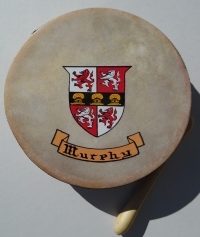 This timeless Irish drum, known in the Gaelic language as a Bodhran, is handmade in Ireland from natural goat skin and mountain ash. 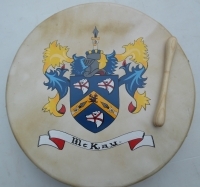 The wee version of our Celtic Drum.